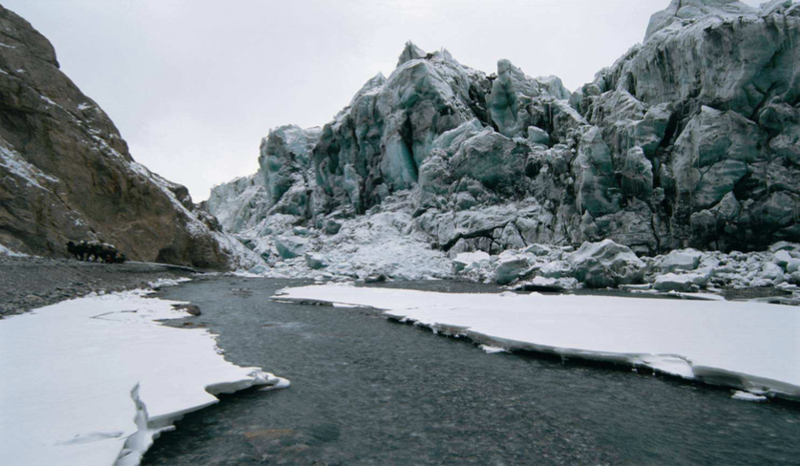 The melting ice from receding glaciers is heightening the risk of Glacier Lake Outburst Flood (GLOF) to critical levels all around the world. This Sino-Swiss cooperation aims to gain a better understanding of this phenomena and reduce human losses to GLOFs by establishing an early warning system and glacier monitoring in the Yarkant River in Xinjiang Province, China. The Yarkant River is located in the southwest of Xinjiang Province, at the south-western margin of the Tarim Basin, and ranks number one in Xinjiang in both flood frequency and in losses caused by floods. The Yarkant River floods threaten an alluvial area of 50,000 km2 with a population of more than 1 Million people, and cause damages and losses of about CHF 11.5 Million (RMB 70 Million) every year (on average). The most violent and disastrous floods result from glacial lake outbursts (GLOFs), and generate peak discharges of more than 6000 m3/s. The largest and most frequent glacial lake outbursts occur in the area of Keleqin River in Shaksgam valley in the Karakoram Mountains, one of several tributaries of Yarkant River. The planned measures combine remote sensing (optical and satellite data) analysis with terrestrial data measurements such as gauges close to the GLOF-prone area and monitoring cameras in the glacier area of Shaksgam Valley. As part of the project two monitoring stations have been installed in Cha Hekou and Kuluklangan (see Figure 1 below). Flood modeling and an emergency risk management plan are other key issues of the project. The Kyagar Glacial Lake drained completely at the end of July 2015. Most of the lake drained spontaneously within only half a day, reaching a peak-flow of approximately 2260 m3/s on July 28th 2015 at 11:18 o’clock local time at Kuluklangan (see Figure 2 below). At the terrestrial observation stations, the water level of the Keleqin and Yarkant Rivers raised considerably within a short time (+ 0.9 m / 6 hours at Cha Hekou and + 1.4 m / 6 hours at Kuluklangan; the water level increase is less pronounced at Cha Hekou due to the wide river bed). Hydrographs of the terrestrial observation stations at Cha Hekou (top) and Kuluklangan (below) showing a continuous run-off increase over several days with daily fluctuations. The GLOF with a pronounced peak discharge has been registered at both stations (orange arrow). Based on camera images by the Kyagar terrestrial observation station and satellite remote sensing the timing and volume of the outburst could be reliably predicted. The implemented fully automatic GLOF early warning system registered the flood wave and sent a warning alarm to the mobile phones of Chinese decision-makers, successfully notifying them of the impending floods. The alarm signal went out on July 28th 2015 at 12:38 o’clock Chinese local time, triggered by the Kuluklangan station. The lead time for emergency actions in the floodplain was approximately 7.5 hours. At Cha Hekou the threshold to raise an alarm was not reached despite the occurrence of flooding. This threshold will be re-calibrated using threshold values based on the recent GLOF event. The ongoing surge-activity of the glacier tongue and the likely impoundment of a new glacial lake in 2016 require preventive measures. The functionality of the early warning system (EWS) should be periodically tested by Chinese authorities and the roles and responsibilities in case of an emergency should be clearly defined. The thresholds for raising the alarm (i.e. critical water level to trigger the alarm at Cha Hekou and Kuluklangan) should be verified and confirmed by Chinese experts. Continuous observation of the dynamics of Kyagar Glacier and the lake basin by satellite remote sensing (e.g. using "sentinel-1"). Risk management procedures (i.e. an emergency plan) in the floodplain along the Keleqin and Yarkant Rivers should be adjusted according to the GLOF hazard potential. Planning of a maintenance field mission for 2016: A new fully automatic station can be installed at Kyagar Glacier. Furthermore, the stations at Cha Hekou and Kuluklangan should be supplied with new batteries. Budget and responsibilities for new Sino-Swiss field missions need to be clarified by SDC and MWR. The exchange of know-how and experiences between Sino-Swiss ex- perts should be continued. Newly gained knowledge of the recent GLOF and its impact should be shared among Chinese and Swiss experts. Based on the shared know-how, the early warning system can be further improved and the risk management in the floodplain (e.g. flood hazard indication map) can be verified and enhanced. Monitoring the dynamics of Kyagar Glacier and the continuous analysis of the GLOF hazard potential is the fundamental precondition to ensure an efficient early warning and flood risk management.